Feet function at their best when behaving as nature intended – weight evenly distributed over both feet and ideally on a flat surface. Obviously in todays lifestyles this is not always possible at the best of times and even more so where podiatric problems have developed or occurred. At Chuckle Shoes we strive to make the individual’s foot function as much in the way that nature intended as is possible, thereby preventing further damage and alleviating discomfort in the foot itself and anywhere else in the body that resulting poor posture often encourages. 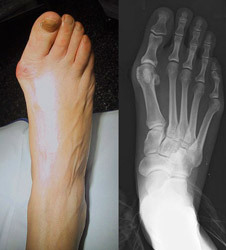 Left: Foot problems not only provide discomfort at their source, they can effect whole body posture whilst standing and walking, causing pain and musculo-skeletal imbalance elsewhere. Extended or thickened first ray (or big toe). This common ailment affects a large proportion of the population. 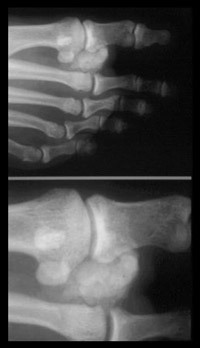 A related condition may affect the fifth ray (little toe) that can be treated in a similar manner. Often considered hereditary this condition can be caused and agravated through long term use of incorrectly fitted footwear or injury. Symptoms of bunions familiar to anyone who suffers from them include irritated skin around the bunion, pain when walking, joint redness and pain, and possible shift of the big toe toward the other toes. Blisters and corns may form more easily around the site of the bunion and neighbouring toes. At Chuckles we evaluate each case individually and have a number of therapeutic techniques such as orthotics that we can choose from as well as building the shoe according to the individual's requirements. Most people who think they have flat feet actually haven’t! 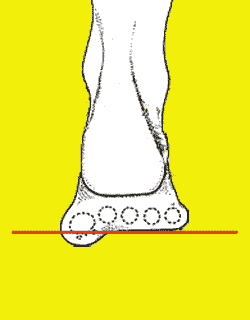 A true flat foot is when a foot is totally flat without an arch even when not weight bearing. What people are actually suffering from is an imbalance (or twist) between the fore foot and heel leading to over pronation – an inward over-rotation of the foot. We build up the shoe accordingly in manner that encourages your foot to behave as close to its natural state or subtalar neutral position. We also arrange for the use of custom orthotics and build the shoe to accommodate. It is particularly important that the childhood developing foot is allowed to behave in a manner that promotes strong and complete growth of connective tissue - muscle, tendon, ligament and bone. To this end being allowed to go barefoot on uneven surfaces is a good idea. When thats not practical wearing Chuckle Shoes is the very next best thing. The wearing of trainer type shoes, especially those with built up arches will prevent the normal development of the foot that should take place between toddler and adolescence and is highly likely to lead to problems in later life. 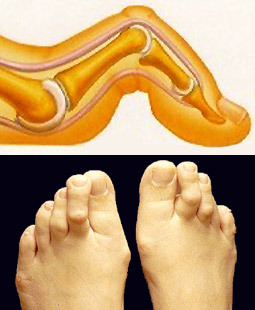 'Mallet toe,' and 'claw toe' are similar conditions affecting the toe joints, however treatment is also similar and as always requires tailoring to the individual. This condition often leads to corns (pressure sores) in the toe joints and tips. We build in accommodating cushioning and toe height and metdomes as necessary to alleviate pressure and encourage correct balancing of the forefoot. Mainly affecting the toes this is where joints have lost the ability to bend or flex preventing the foots natural shock absorbency and ability to ‘toe off’ at the end of the step. This condition can include but is not limited to the hammer, mallet and claw toes discussed on the previous tab. Often caused by arthritis or injury (which can in turn lead to over-calcification and/or arthritis) fixed joints can lead to knee, hip and spinal problems further up the line. We use correctly formed and placed sole structure to encourage the natural behaviour of the foot and therefore movement during the walking action (gait cycle) removing the root cause of these problems. Joints misplaced (or plantar flexed) through birth defect or over time as shearing forces in the foot cause some joints to drop below others over time. 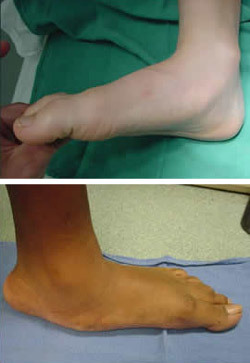 Most commonly affecting the first ray (or big toe) this plantar flexion can be both mobile and fixed, requiring different approaches to treatment. There is high potential for this condition to lead to a number of other musculo-skeletal problems due to improper gait while standing and walking - knees, hips and lower back are likely to adjust their movement from the ideal in order to compensate leading to injury and discomfort. We utilise ‘rafting’ techniques supporting the foot concerned making areas that can take the strain do so and cushioning cut outs of the sole to relieve those that can’t, returning the skeletal function to as near normal as possible. A corn or clavus (plural clavi or scientifically named heloma) is a small circle or oval of thick skin that usually develops on the tops and sides of toes or on the sole of the foot. 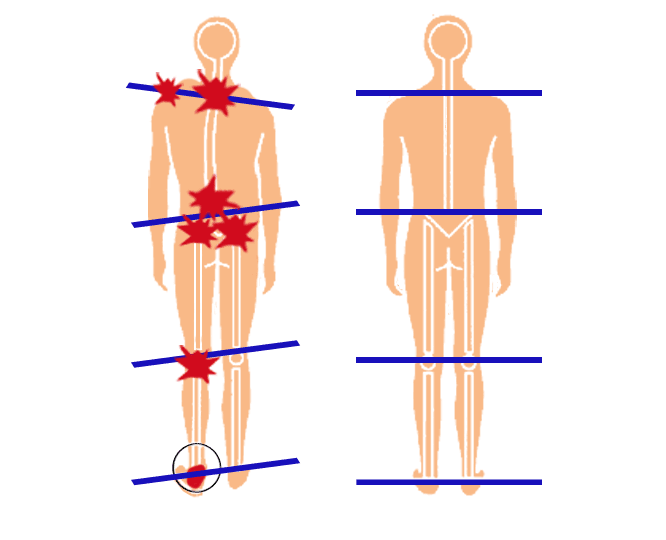 They form when a pressure point against the skin traces an elliptical or semi-elliptical path during a rubbing motion, the centre of which is at the point of pressure, gradually widening. If the source of the pressure is not alleviated, new skin is likely to continue to grow as a corn even after the corn is surgically removed. Because of their shape, corns can actually intensify the pressure causing deeper tissue damage and even ulceration. "Hard" corns (helomata durum) tend to occur on dry, flat surfaces of skin. "Soft" corns (helomata molle) are often found between the toes. These stay moist, keeping the surrounding skin soft while maintaining a hard centre. The common cause would be improperly fitting shoes, whether due to fashion, incorrect measurement or pre-existing foot problems or deformities that require bespoke alterations in order to prevent pressure points from occurring. Chuckle shoes employ several techniques to alleviate and prevent corns, mixing and matching after personal assessment in order to provide the most appropriate solution to the individual concerned's problems. 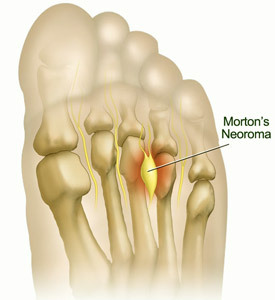 More accurately Morton's neuroma (also known as Morton's metatarsalgia, Morton's neuralgia, plantar neuroma and intermetatarsal neuroma) and can be considered seperately from the more general (and potentially more worrying) term 'neuroma'. Despite it's name the condition was first correctly described by a chiropodist named Lewis Durlacher in 1845. This is a benign growth of fibrous tissue formation around an area of the intermetatarsal plantar nerve, most commonly of the third and fourth intermetatarsal spaces and is often characterised by pain and/or numbness, sometimes relieved by removing footwear. At Chuckle Shoes we use orthotics and special construction techniques to create the correct footwear around the individual case.